In 1900 the discovery of a Cave Library at Dunhuang hidden for almost a thousand years revolutionized scholarship on China and the many civilisations of the Silk Road. Containing tens of thousands of manuscripts, the world's earliest dated printed book and hundreds of fine paintings on silk, this is the world's earliest and largest paper archive and a treasure trove of medieval art. 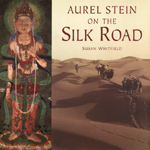 Numerous other ancient silk road sites in western Chinese yielded other important artefacts, paintings and manuscripts in over twenty languages and scripts and this material was dispersed to institutions worldwide, making access difficult. The amount of material created a problem for conservators and curators and throughout the twentieth century much remained uncatalogued and in need of conservation. 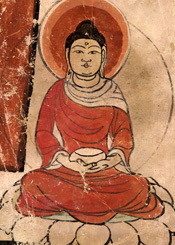 The International Dunhuang Project (IDP) was founded in 1994 to address these problems by creating a partnership of all the major holders of the material to work together on conservation and cataloguing and to increase access by creating a comprehensive online catalogue of all the material, linked to high-quality digital images and supporting information. The last 10 years have seen IDP grow in size and success . With centres in China, Russia and Japan and collaborations with other institutions worldwide, IDP is now the largest and most successful digitisation project of its kind; IDP now offers free worldwide access to all to over 50,000 paintings, artefacts, historical photographs and manuscripts, with more being added daily. 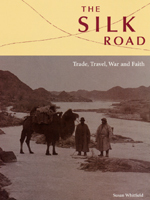 2004 was a particularly successful year as it saw Cataloguing and Digitisation Centres open at the Institute of Oriental Studies in St. Petersburg and Kyoto (p. 7) and the British Library exhibition, The Silk Road: Trade, Travel, War and Faith (pp. 4-5). This was held in collaboration with the British Museum with loans from China, Japan, and Europe. Ten years ago making the vast and complex Dunhuang and Silk Road collections more accessible through digitisation and an online database was little more than a dream. We had no funding and the technology, as it was then, was expensive and crude. But supporters were found and the technology developed. The problems of a decade ago — expense of storage, quality of digitial images, and access to large images online — are now largely problems of the past. Other problems — the migration of digital data, for example — are being addressed by the community. IDP will continue to adapt in order to exploit new advances to make this material much more accessible to everyone, but we need your support. With the foundations laid and a large resource already amassed, IDP is now preparing to expand its educational and research strands with the aim of making the history of the Silk Road known to schoolchildren and scholars from Shanghai to Sacramento. With two major grants coming to an end next year, however, we need to raise the funds to achieve this. We welcome and need your support to continue our work to make the Silk Road more accessible to all, and details of how you can help are given on p.8. IDP has made numerous friends over the past ten years and we would like to take this opportunity to thank all of them and commemorate just a few that space allows with a timeline of IDP milestones. 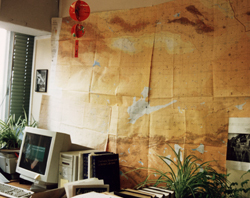 Left:The first IDP Office in London with one computer and a Silk Road map. 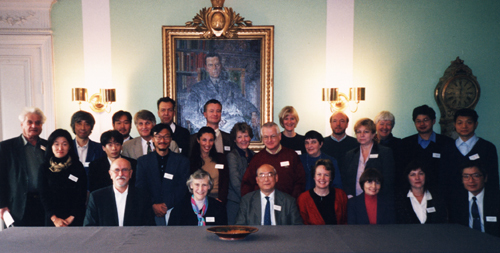 October 1993: 1st conference bringing together conservators and curators of Dunhuang and Eastern Silk Road material from all the major holding institutions. Everyone resolves to work together to conserve and increase access to the collections through international collaboration. 1994: IDP founded following 3-year grant from from the Chiang Ching-Kuo Foundation (CCK). One member of staff. First issue of IDP News. 1995: IDP database designed and in use. Sponsorship agreement with UK suppliers of 4D database for software and consultancy over two years. IDP and consultant start work on designing and implementing database. 1997 Extension of CCK grant for a further year. International conference on Dunhuang forgeries held in London (for proceeedings see p.6). IDP Symposium at ICANAS, Budapest. Successful application to the Heritage Lottery Memorial Fund (HLMF) for a 3-year grant to digitise and catalogue. 1998: Extension of CCK grant for a further year. 2nd full-time member of staff starts work on digitisation of fragments from Stein's 3rd expedition. 3rd Conservation Conference held in Berlin. Launch of IDP Interactive Web Database containing details of over 20,000 manuscripts and over 1,000 images. 1999: 3rd full-time member of staff to work on cataloguing and digitisation of Tibetan manuscripts as part of HLMF project. 4th Conservation Conference held in St. Petersburg (for proceedings see p. 6). 2000: Launch of the IDP Map Interface on the web. Support from the Higher Education Funding Council for England for an IDP Digitisation and Network Manager. 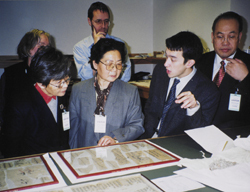 2001: Start of a 5-year collaboration between the British Library and the National Library of China (NLC) funded by the Sino-British Fellowship Trust to catalogue and digitise the manuscripts at the NLC. Start of a 4-year project funded by the Andrew W. Mellon Foundation to digitise over 4,000 Chinese manuscripts from Dunhuang in London, representing 35,000 images. Specialist IDP Digitisation Studio established with 3 photographers and 2 Photoshop operators. Part-time Administrative Manager also joins team. Left:Ren Jiyu, Director of the National Library of China, at the launch of the IDP Chinese website. 2002: Work starts on a 3-year collaborative project with the School of Oriental and African Studies to catalogue and digitise the Tibetan tantric manuscripts from Dunhuang funded by a grant from the UK Arts and Humanities Research Board. 5th Conservation Conference held in Stockholm. Launch of Chinese version of the IDP Interactive Web Database hosted by the National Library of China (http://idp.nlc.gov.cn). 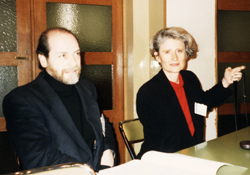 Left:Jacques Giés and Monique Cohen at the Paris conference. 2003: British Museum Dunhuang paintings go online on IDP. Grants awarded by the Mellon Foundation and CCK for establishing a digitisation and cataloguing centre in Russia. Dunhuang Conservation Conference held in Kyoto. 2004: Exhibition, 'The Silk Road: Trade, Travel, War and Faith' (pp.4-5) is visited by 155,000 people. Opening of IDP Centres in St. Petersburg and Kyoto (p.7). 2005: April 6th Conservation Conference to be held in Beijing. Launch of IDP interactive web database in Russian and Japanese versions. Launch of the IDP Educational Resource 'Buddhism in Central Asia' and a personalised web space. Left:IDP visit to the Dunhuang Academy Museum to examine Tibetan manuscripts. 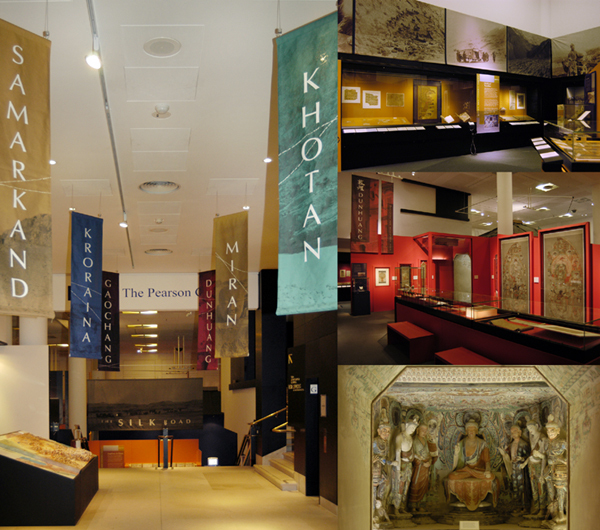 The Silk Road: Trade, Travel, War and Faith was the most successful exhibition ever held at the British Library, attracting over 1200 visitors per day during its opening from May 7 to September 12, 2004. The exhibition led the visitor on a tour from Samarkand, home of the Sogdians, along the southern Silk Road through the ancient kingdoms of Khotan and Kroraina to the Tibetan fort at Miran, the Chinese garrison town of Dunhuang and the Uighur stronghold of Kocho. Over 400 exhibits were brought together from collections in the UK, France, Belgium, Germany, China and Japan. They introduced all aspects of life along the Silk Road during the first millennium, from everyday objects such as mousetraps, shoes and sieves for milk, to the exquisite paintings found in the Library Cave at Dunhuang. 300 of these objects were from the Stein collections at the British Library, the British Museum and the Victoria and Albert Museum, and the explorations of Aurel Stein were also a theme of the exhibition (see below left). Apart from the fully illustrated exhibition catalogue (see p. 6) a short brochure has been produced by the British Library to celebrate the exhibition and its success and copies are available on request from IDP. An online exhibition gallery showing all the exhibits with captions will continue to be available on the IDP web site. The exhibition was held in collaboration with the British Museum and was generously supported by the Pidem Fund, with additional support from The American Trust for the British Library and the Sino-British Fellowship Trust. Thanks also to the many other individuals and companies who supported the associated events. The learning department of the British Library and the BBC Proms held four summer workshops for children aged 11-19 to work with professionals in digital and visual art, performance poetry, music composition and music theatre. This culminated in a three-hour performance at the Shaw Theatre next to the British Library on 14 August, which was followed by a special workshop for the performers and their families by Yo-Yo Ma and his Silk Road Ensemble. The performers were also able to attend the concert given by the Silk Road Ensemble at the Royal Albert Hall on the following day. The workshop continues with a discussion group and other activites which can be viewed on http://bllearning.co.uk/live/sound/silkroad/. A number of other events were held in conjunction with the exhibition including lectures, a symposium on Khotan and a series of public musical performances. A highlight was 'Manas and Music', a recitation of the medieval epic about the Kyrgyz hero Manas by manaschi Rysbek Jumabaev and Ben Haggarty. This collaboration between artists from the Silk Road ensemble and the Kyrgyz republic was specially commissioned for the Silk Road exhibition and presented by the Silk Road Project Inc. in collaboration with the Aga Khan Music Initiative in Central Asia, a programme of the Aga Khan Trust for Culture. The perfomances, held over a week in the British Library front hall, were attended by hundreds of people. Another concert also had its premier at the British Library, namely a chamber ensemble version of Mahler's Das Lied von der Erde sung in Chinese in an arrangement by Glen Cortese and Daniel Ng. Mahler was inspired by the German translations of 8th-century Chinese poems to compose this work. It is fitting that this Chinese version should be performed at the time of an exhibition also celebrating cross-cultural inspiration. The soloists were Robynne Redmon and Warren Mok, and the Chamber Orchestra Anglia was conducted by Sharon Andrea Choa. Since this is a commemorative issue for the 10th anniversary of IDP we are reviewing a selection of old and new publications. All of these are still available and ordering details are given below. Proceedings from the first conservation conference held in the UK in October 1993 were published in 1997 as the inaugural volume of a new series, The British Library Studies in Conservation Science. Its aim is to provide a forum for conservators to learn about new applicable scientific methods and scientists to learn about conservation issues that might benefit from a scientific solution. The second volume (1998) was the result of doctoral research carried out by Peter Gibbs under the supervision of Professor Kenneth Seddon in the Chemistry Department at The Queen's University of Belfast. This involved analysis of fragments of Dunhuang papers to identify the dyes used and showed that huangbo, the traditional Chinese yellow dye from the bark of the Amur Cork Tree, was the main colorant. 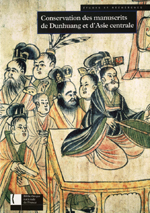 The third volume (1999) in the series comprised the collected papers from the conference held at the British Library on Dunhuang manuscript forgeries, bringing together scholars, curators, conservators and scientists to discuss this issue. All three issues are still in print and available via the British Library online bookstore: See our publications page for details. The series is intended for a general conservation and science audience and the next volume will be an overview of Raman Spectroscopy, looking at its application across a range of material in the British Library. It was decided not to publish papers from the Berlin conference. For the St. Petersburg conference a selection were published in the journal Manuscripta Orientalia (http://orient.thesa.ru). The Stockholm papers are forthcoming and will be announced in a future issue of IDP News. This contains colour images and extensive captions for the 400 exhibits, introductions to each geographical section, and eleven essays by leading scholars in the field, as well as a bibliography and index. IDP was founded in 1994 as a collaboration between the major holders of Silk Road collections. We are delighted that ten years on work is well underway on adding cataloguing information and digital images of most of the collections into the one-stop IDP interactive web database. The material is now being brought back together and made freely and easily available to scholars worldwide. Since the Chinese website went online in November 2002 the number of users accessing it has increased monthly and it is now visited as much as the English version. With the opening of digitisation and cataloguing centres in Russia and Japan and websites in both languages, more material will be more accessible to more scholars. We look forward to similar collaborations with other partners over the next few years. Generous grants from the Andrew W. Mellon Foundation for the digitisation of material to add to the Mellon International Dunhuang Archive on ArtSTOR and from the Chiang Ching-Kuo Foundation for cataloguing, enabled the opening in 2004 of a cataloguing and digitisation IDP Centre at the Institute of Oriental Studies (IOS), Russian Academy of Sciences, St. Petersburg Branch. The IOS is a founder member of IDP and has been actively involved since 1994, hosting the 3rd Conservation Conference in 1998. Details of its collections were given in IDP News 2. The cataloguing and digitisation will start with the Chinese manuscripts from Dunhuang, numbering almost 400 scrolls and 1,800 fragments. Two postgraduate students are now inputting data, starting with the printed catalogue. The Institute's conservators will continue their excellent work preparing manuscripts for digitisation. This will be carried out by two photographers/Photoshop operators. New cataloguing work will be carried out by the Academy's research fellows. A computer engineer maintains the server and systems. Dr Irina Popova, Director of IOS, and Dr Susan Whitfield, Director of IDP are providing overall management while Dr Imre Galambos of IDP is overseeing the project. The computer equipment and database have now been installed and inputting has started. The photographic equipment has been ordered and the photographers will come to London on a training visit shortly. IDP photographers will return with them to St. Petersburg to help set up the equipment and digitisation will then begin. A Russian version of the IDP web site will be online in 2004. 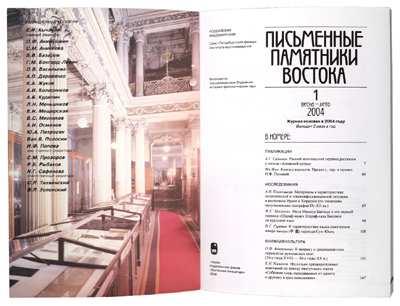 Images of the St. Petersburg manuscripts with searches in Russian will be online in 2005. 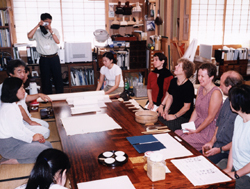 Right:Delegates from the 2003 IDP Conservation Conference in Kyoto visiting a conservation studio. The IOS is not only a repository of the Dunhuang manuscripts but also a rich source of expertise. The many Academicians publish widely and to celebrate their work the IOS has launched a new journal, Pis'mennye pamiatniki vostoka. It is published by Nauka and the first issue (shown above) is Spring-Summer 2004. Contributions are welcome. We were delighted to sign an agreement in 2004 for collaboration with Ryukoku University, Kyoto, Japan for the digitisation and cataloguing of Dunhuang and Silk Road materials in Japan. Ryukoku University holds 8,000 items from the Otani Collection found in Nishi Honganji after the Count's death. These include many photographs, notes from the exhibitions and specimens of dried flowers collected en route. This collection is supplemented by items from the Tachibana and Yoshikawa Koichiro Collections, including manuscripts and painting fragments. The largest and most successful digitisation project of its kind, IDP now gives free worldwide access to over 50,000 paintings, artefacts, historical photographs and manuscripts, with more being added daily. Although hosted by the British Library, the IDP is an exemplar of international collaboration through which skills, technologies, expertise and knowledge are shared for common benefit. Local staff in China and Russia have been trained to use the latest digitisation and computer equipment; conservation and scientific advances are exchanged; and everyone with access to a computer can add their own knowledge to the interactive web database. The multilingual website receives 50,000 requests a day - more than 15 million in 2004 alone - and has been widely praised as an 'essential scholarly resource'. Now the infrastructure has been established, we would like to reach out into the wider community by creating educational resources - in local languages and with local teachers - for schoolchildren and students from Shanghai to Sacramento. The database will be made even more accessible through the addition of a personalised web space, maps, photographs, music, video clips and translations. 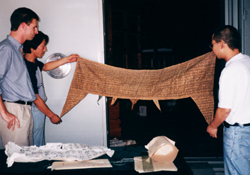 During the period 2005-10 we will work with scholars and universities worldwide to create a new field of palaeographical studies for Asian manuscripts, including a postgraduate training programme, and employing young scholars to carry out innovative research. New partnerships, especially in China and Central Asia, will be forged to achieve this. Finally, by the end of the next five year period we expect to have identified, conserved, digitised and catalogued more than 80% of all the material discovered in the Silk Road cave - an extraordinary and unparalleled achievement. Together these initiatives will enable us to bring the incredibly rich historical resources of China and Chinese Central Asia to an international audience. We would be very grateful for your help as we address the challenge of securing the USD4 million needed to deliver the next five years of IDP. The project has been self-financing since its inception, and a number of major grants come to an end during 2005. 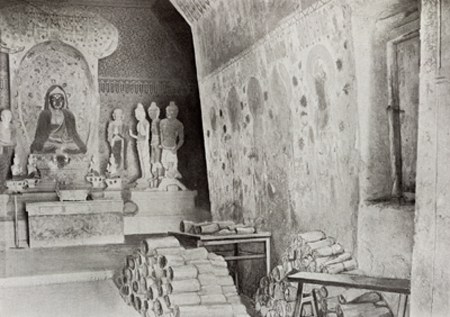 You can help by sponsoring a sutra, as many did at Dunhuang through the ages. If you would like to talk to IDP about support of a larger part of its work please contact the IDP Director and the address below. All funds received will be put directly to the work of the Project and you will see the results directly as the educational and research resources grow daily on the website and through publications.